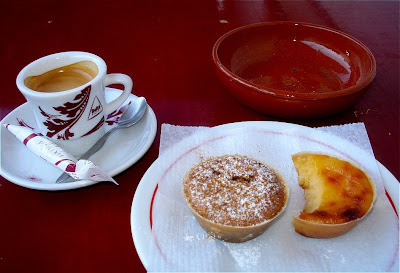 Queijada: small pastry cake filled with cheese or a sweet filling. 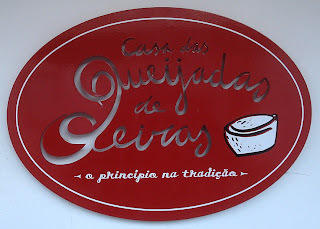 'Casa das Queijadas de Oeiras' is a small downtown café where you can have the best ones. From plain cheese to chestnut, you choose the flavour. Looks delicious. I'm wishing I could join you for one. That makes me hungry. Looks very good. This is classic! I'm checking them out on my blackberry this morning..(processor is a bit slow)but just love that last one! The first- just elegant!! Nice post to view first thing! Yummy photos. This would easily become my favorite place in your town! Nice and red and sweet (for Valentine's Day?). Even the floor is nice. Hey - wait for me! Delicious photo! Since you're not in that red chair, Jose', I guess you enjoyed the coffee and yummy treat - then died and went to heaven! This is very good: I love queijada. A nice set of picture and the last one is simply... perfect. It does look delicious. What sort of coffee is that? Is it an espresso or something different? You make it sound as good as you make it look. I'll try one of each. Love that bottom photo - it's so good. Oh yeah! Right here, right now! With a bica. I love the intense red table and chairs!